Some might dismiss the idea that ‘all teachers are leaders in the classroom’ as management piffle designed to convince the world that there’s more to teaching than tea breaks and long holidays. Suggesting that a 22-year-old NQT is somehow a ‘leader’ the instant they step in to a classroom is, perhaps understandably, ignored by many critics. But after setting aside my own instinctive mistrust of the phrase, I have come to believe that there is more than a grain of truth to this (admittedly a bit cheesy) rhetoric. Last week, I blogged about relationships. As a teacher, your aim should be to get 100% of pupils to be ‘with you’- i.e. they are inspired to work hard for you because they trust you. But what specific actions can we take to ensure that every single kid is ‘with you’? What does that actually look like in the classroom? The best teachers know their classes inside out. They can read an expression on a kid’s face and instantly have an idea of what might be going on, and know how to fix it and get the kid back on track. Because great teachers put the time in to building strong relationships, they are in a better position to be able to respond appropriately when kids aren’t really on board with the lesson. Despite our best efforts, it can sometimes be very difficult to get every single kid in the room to buy in to you and your subject. In some lessons, you’ll feel the ‘buzz’- you’ll know that every kid is working hard and trying to please you. But other times, the lesson might feel a bit flat, or you might feel that a few kids aren’t quite as ‘on board’ as you’d like them to be. Of course, kids will be kids, and there are some things that even the most inspiring teacher will struggle to overcome. But if you think about teaching as ‘leadership’ in the classroom, you are forced to consider how you might be able to influence every kid to be as engaged in the lesson as possible. –Robert looks a bit miserable today, so I’ll tell a quick joke to get him back on track: “Are you alright Robert? I know you’re loving the lesson really, so try to show it please”. If you know your kids well, you are able to judge each situation. Some kids won’t react well to being put on the spot in front of the rest of the class- others will rise to the challenge. Some kids won’t mind a bit of a joke, but some might be upset by it. You have to know them really well and understand what motivates them in order to use the best strategy in every instance. Importantly, none of this is possible without knowing the kids really well. Knowing what motivates every single one of them- getting the best out of every child- that’s the key to great teaching. As much as I instinctively disliked the expression, it is in fact very useful to think of teaching as a leadership exercise. You are trying to get all your pupils to do something really difficult. You’re trying to effect change, to get them to go further than you ever expected, and to achieve things that they don’t yet know they are capable of achieving. Just like any good leader, you play to each person’s strength, encouraging and deflecting, prompting and reminding as necessary until you have them all with you. The best teachers understand that kids are human – that they will have good days and bad, and that they need encouragement and guidance from their teacher. If you can read the room accurately, and respond to issues appropriately as they crop up, you are leading them. And if you lead them well, they will succeed more than you- or they- ever thought possible. Follow me in to battle. Last week, I wrote about the importance of strong behaviour systems in a school. Without them, it is very difficult for teachers to form strong relationships with their classes. And whilst I firmly stand by the idea that systems give teachers more- not less – autonomy, I wouldn’t want teachers to abandon the pursuit of strong relationships altogether. In fact, I would argue that teachers must work hard to make the most of their newfound freedom. Without the burden of challenging behaviour, teachers are now free to work on relationship building. But where does one begin with such a task? 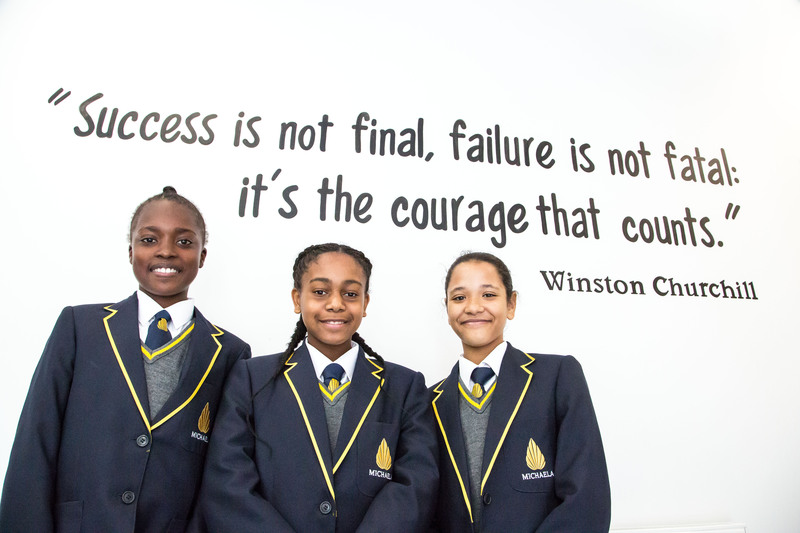 At Michaela we talk a lot about getting the kids to ‘follow you in to battle’. A dramatic metaphor, yes, but it is a helpful way of looking at your class. Is every kid ‘with’ you? Are they all behind you? Will they follow you and do what you say because they believe that you have their very best interests at heart? If kids aren’t ‘with’ you like this- then all the systems that you have put in place will only have so much impact. You might have a classroom of kids who are looking at you and listening to you- and yes, that will give them more chance of success than a chaotic classroom, but you won’t get the absolute best out of them unless they are 100% ‘with’ you. They have to believe in you, they have to be inspired by you- they have trust you enough to be willing to ‘go in to battle’ every single lesson. This isn’t easy: it takes time, energy and a genuine desire to get the most out of your kids. It’s why I don’t think you should be a teacher if you don’t like kids that much. You have to really want to see them succeed or they’ll never be as ‘with you’ as they need to be. But whilst it isn’t easy, it is possible. Assuming you do like kids, there are a few things you can do in the classroom that will have a big impact on your relationships. Here are a few general approaches that I think make a difference. There’s nothing worse than false positivity or praise. Kids are like dogs- they can smell a fake a mile off. If you want to praise them or speak enthusiastically about something, do it but be genuine and never fake it. Find a way that is authentic to who you are: avoid phrases that you wouldn’t usually say, and avoid behaving in a way that doesn’t sit naturally with your personality. It has to be real or they won’t care. So with a genuine face on, show them you enthusiasm for your subject and narrate what you enjoy about the time you spend teaching them. Smile. Be genuinely happy to see them. You are your pupils’ cheerleader. Tell them how much you want them to succeed. If you notice that one kid isn’t working as hard as they usually do, tell them that you don’t want them to fall behind. If the whole class has performed better than you expected on their most recent assessment, tell them how proud you are and how much you want them to keep this up for the next assessment. You are on the side-lines, willing them to succeed at every turn and hurdle. You show them that you will never give up hope that they can do it. This doesn’t come easy to everyone. If you are naturally funny, then great: you have a gift and you should make the most of it in the classroom. But you don’t have to be cracking jokes every five minutes to be a ‘funny’ teacher. You could, for instance, ask them to read aloud in a funny accent, or laugh along at the jokes that they make. Allowing a little bit of wiggle room for a laugh here and there works wonders for a class. Everyone loves a laugh. Of course, you don’t want a lesson to descend into chaos, but a few laughs make the whole lesson feel more relaxed and joyful. If you’re on playground duty at lunchtime and you see one of the kids you teach, you could go over and ask them how their day is going, or try to find out their interests. A simple ‘how was the match on Saturday?’ or ‘hope you’re feeling better today’ can do a lot to show kids that you care. Similarly, if you notice that one kid looks a bit down or isn’t on form like they usually are, pull them to one side after the lesson for a quick pep talk- sometimes this can make a huge difference to a child’s day. Expect the very best from them- and tell them this all the time. Don’t relent. Kids know when they are being pushed, and know when teachers give up on them. Every lesson should feel like a fight- you’re getting them to learn new and challenging stuff. You need every kid on board, listening and working hard so that they stand the best chance of being successful in the future. Always make the link between the lesson you are teaching them and the future that lies ahead: if they work hard today, they can succeed tomorrow. If they know that you are pushing them because you really care about their future, they will be inspired to work hard for you. Don’t rely on systems to get you through a lesson. They are necessary, but not sufficient for great teaching. The best teachers understand that the systems in place at their school free them up to get on with the tough job of getting every single kid to learn as much as possible. So make every lesson count. Get them behind you and get them feeling inspired to succeed. How can a teacher get the best out of his or her classes? I am an unrepentant fan of strong systems and structures in a school. Without them, teachers cannot teach and pupils cannot learn. Without order and calm, a teacher simply cannot deliver a lesson. We’ve all been there- lesson derailed by a group of kids who keep interrupting or messing about, or by that one kid who insists on farting or doing something ridiculous every time you try to speak. It is utterly soul destroying, particularly when you notice a few quiet kids at the back of the room desperately trying to listen and get on. Systems can, of course, put a stop to all of this. If every teacher in the school administers detentions for rule-breaking, kids will quickly learn to stop breaking the rules. This sounds easier than it is. It depends enormously on staff working together and following the systems consistently. Without this consistency, you have a situation in which the kids know they have to behave for one teacher (and probably resent them for it), but get away with messing about for another. Behaviour systems provide everyone- pupils and teachers- with clarity. If you believe that every child is capable of reaching a high standard, and if you all enforce the rules properly, then disruptive behaviour is much easier to manage, and teachers can get on with the job of teaching. Some of the more vocal sceptics of this approach point out that enforcing systems like this can be problematic. If we reduce behaviour management to a simple administration exercise, we lose something. We lose the chance to build meaningful relationships with our pupils. If you have to enforce a set of rules, you somehow lose the ‘human’ side of teaching, and the necessary teacher autonomy that goes with it. I don’t see this as an ‘either/or’: systems vs. relationships. It isn’t the case that teachers who enforce rules have no relationships with their classes- or that systems somehow get in the way of relationships or teacher autonomy. On the contrary, good systems give teachers the autonomy to form more powerful, enduring relationships with their pupils. Rather than being constrained by the challenges of bad behaviour, teachers are free to get to know their classes and teach their subjects really well. In a chaotic classroom, where the teacher is standing at the front shouting ‘ssh- get on!’ every 5 seconds, or where they are constantly ignored or spoken over, or shouted at or sworn at, it is very hard to form meaningful relationships. In fact, it takes someone with the personality of a relentless bulldozer to overcome it. It is exhausting, and in fact it’s no surprise that so many teachers leave the profession. If every single lesson is punctuated with bad behaviour, you feel like you’re wasting your time. It’s hard to feel like you are changing children’s lives if you can barely get a word in. In a calm, focused classroom, on the other hand, the teacher really can build those relationships. There is time for an in-joke, a smile, a conversation, or a genuine exchange of interesting ideas. If all pupils are in the habit of focusing and listening to their teacher, there is space for them to get to know each other. In a focused classroom, children feel successful because they come away from every lesson having learned something new. They learn to love their teacher because they know how much the teacher does for them. They are free to learn because their teachers are free to teach. They don’t have to show off in front of their mates, or pretend not to care out of fear of being called ‘boffin’: in a focused classroom, where learning is the norm, and where teachers are free to teach, children are free to get on, to listen and to learn. For every teacher to be able to get the most out of their classes, they need the freedom to be able to build relationships. School leaders must ensure robust systems are in place, and must back their teachers at every turn. But more than this, school leaders should continually encourage teachers to build as many relationships as they can. Connecting with kids- making them feel special, tapping in to their interests and likes and dislikes, making them love you so that they are mortified if they disappoint you- that is the key to excellent teaching. Yes it may be the case that some teachers can achieve this even in the absence of strong systems, but it would be a heck of a lot easier for everyone if they didn’t have to. Next week I will talk in more detail about how teachers can develop strong relationships with their pupils. Back in my early years of teaching- in the high-pressure ‘Special Measures’ school where I cut my teeth- I spent hours planning lessons that aimed to get kids through the GCSE as quickly as possible. I think lots of teachers are in the same boat. The high stakes accountability system puts the pressure on, and in many cases this can warp the curriculum and the way that we teach. In the mad rush to get pupils better at the skills required for the GCSE, we teach the skills required for the GCSE directly. In my subject, English, this might mean getting pupils to practise writing a paragraph every lesson with the longer term objective being to improve their paragraph writing skills- a skill they need to demonstrate in the exam. But isn’t this a bit like suggesting that, in order to get better at marathon running, you should run more marathons? In my earlier teaching years I was under the illusion that the skill of writing good analytical paragraphs could be developed by practising writing lots of analytical paragraphs. But this, as Daisy Christodoulou makes clear in her excellent book ‘Making Good Progress’, is ineffective. Counter-intuitively, as Daisy explains, practising a skill directly doesn’t do much to develop that skill. In the same way that a couch potato isn’t going to get up and run a marathon without any training, a weak writer isn’t going to be able to write a perceptive, analytical paragraph without a lot of baby steps beforehand- no matter how many times they’ve been shown to write a perceptive, analytical paragraph. Literary analysis is a complex skill made up of lots of smaller pieces of knowledge (and indeed, other, less complex skills, themselves comprised of more knowledge). After a lot of thinking, this began to make sense to me. But why is it the case that practising analytical writing won’t actually do much to develop analytical writing skills? What makes someone a ‘weak writer’? And for that matter, what makes someone a good writer? In this post, I want to explain why I think it’s a bad idea teach skills directly. In my next post, I’ll discuss some alternatives. I’d say I have written a couple of reasonably good literature essays over the years. Does that mean I could write a decent microbiology essay? Unlikely! Okay, I admit that example could be written off as a straw man, so how about this: I could probably write a good Othello essay, but could I write a good Much Ado about Nothing essay? Probably not- I barely know Much Ado. I’d need to spend a long time reading it, watching different versions, reading around it, thinking about it deeply, and so on. And I would wager that I wouldn’t be able to write as perceptively about Much Ado as I would about Othello because I haven’t been thinking about it in as much depth for as long. I know Othello pretty well, and the more I think about it, the more I see in it. It’d take me years to bring my Much Ado knowledge up to the level of my Othello knowledge. In fact, I would even go so far as to say that I can write a better Othello essay now than I could when I studied it for A level. And I wouldn’t say that is necessarily because my analytical writing skills have improved (like I say, I’d still write an appalling Much Ado essay)- but rather, it’s largely because I have read and thought about Othello several times since then, and so my knowledge and understanding of the play have deepened. Similarly, if writing a good Much Ado essay was dependent on my essay writing skills being good, then I’d be able to write one just fine because I’ve already proven that I can write a good Othello essay. But again, that seems unlikely. It is difficult to transfer skills between domains. Knowing what the text is about is crucial to being able to write about it. This is why pupils struggle so much with ‘unseen’ exam questions: if they are given a text that they really don’t understand or know anything about, they are far less likely to be able to write something perceptive about it- even if they have been drilled and drilled and drilled in analytical paragraph writing skills. They could have written a brilliant essay on another text, but on a text they don’t understand, they are scuppered. The other downside of teaching skills directly is that pupils miss out on the opportunity to practise getting to know the content better. In English, I’d much rather pupils spent time discussing and thinking about the characters in Macbeth, or getting to grips with complex Shakespearean language, than practising writing exam-style paragraphs. Knowing the text inside out is far more likely to yield results than pumping out PEE paragraphs every lesson. We shouldn’t let the pressure of impending exams shift our focus too far from the content itself. If we prioritise knowing the content inside-out, our pupils stand a much greater chance of succeeding in the exam when the time comes. This has massive implications for assessments and for teaching. Next week, I’ll have a go at offering some suggestions for more focused practice activities. In my career as SENCO so far, I’ve often found myself at loggerheads with people who tell me that pupils with Special Needs can’t do things. Whether we’re talking about learning to read, writing for extended periods, or retaining focus in class, I always end up strongly disagreeing with anyone who tries to tell me that it is simply not possible for a child to do it. This happens often, and every single time it does, I am appalled. The people who spout these sorts of phrases seem to suggest (and in fact, sometimes explicitly assert) two maxims. Firstly, that some children don’t choose their behaviour. And secondly, that because they don’t choose their behaviour, we must never try to change it because that is unkind and uncaring. This angers me because it imposes an obvious limit on the child’s capacity to improve. By telling schools, parents and pupils that struggling to learn or behave is a consequence of an irreparable issue within the child, we condemn the child to never being able to change. This is precisely why, at Michaela, we believe that labels damage children. It doesn’t mean that I don’t recognise the challenges some children face, but rather I worry about the consequences of focusing purely on the ‘need’ instead of getting the behaviour we want in the long term. It is important that we at least aim for all children, regardless of need, to be able to learn and behave appropriately. If that’s not our aim, then what is? I have met countless people who try to impose these astonishingly low expectations on the pupils at our school, and every time I do, I have to fight to keep expectations high. It seems mad to me that I have to defend the right to educate children effectively, but that is at the very heart of what it means to be SENCO at Michaela. As a school that does things differently, and that aims to achieve the highest possible outcomes for every child, I often feel as if we are fighting against a tide of negative defeatists who genuinely do no think that some children will ever be able to achieve our aims. Tell a child that phonics won’t work for him because of his ‘needs’, and you disempower him. Tell a child that starting a fight in the playground or swearing at a teacher was not his choice, and you undermine him. Tell a child that he can’t concentrate for more than a few minutes, and you erode any belief he has in his potential future success. Of course children may struggle to meet expectations (of learning and/or behaviour) at first. That’s the nature of the beast. But it doesn’t mean that, simply by virtue of the fact that the child has a label attached to them, that they will never be able to meet these standards. It just means they haven’t learnt the right behaviours yet. And the more that people come in to the school and tell me we’re wrong to do what we do, the harder it is for the child to overcome these barriers. So if you are in my position- either as a SENCO fighting against a tide of the most despicable orthodoxy, or a classroom teacher or a Head of Department or a Literacy Lead just desperately trying to get your weakest or most vulnerable pupils to learn and behave, hear this. There is no limit to what a child can achieve if you focus on getting the behaviours you want. If he’s struggling to learn, create conditions for high amounts of practice and drill, drill, drill him until he gets it. If he’s struggling to behave, teach him how to behave with love and respect, and do not relent. As soon as you excuse his behaviour or his underachievement, you let him down because you are implicitly telling him that he cannot do it. And he can. He really, really can.